The vast majority of PR consulting firms are 1 or 2 person shops. They’re often the best avenue for outside PR help as the principal (the true expert) is the one that works on your company’s account, not a lower salaried associate working their way up the PR chain. Of course, a big challenge in the 1 and 2 person company is that this expert also has to do all the time consuming ‘busy work’ necessary to do a good job for their client. A $10/hr intern would be perfect for much of this busy work, but the time it would take an intern to amass much of this and the sporadic nature of when you need this help still adds up to a healthy expense. 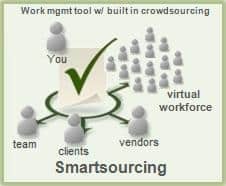 Jeff Rutherford and Maria Colacurcio joined our Thursday tweetchat to share their experiences with crowdsouring their busy work done. It’s only a matter of time before more PR professionals take the plunge into making more profit while doing less work. Guns are bad because they are used to kill innocent people in schools and shopping malls. Derivatives are bad because unscrupulous people pushed them beyond reasonable risk for their own short term gains. And, following suit, Mechanical Turk, or paid Crowdsourcing, is bad because it exploits workers and devalues skills in the status quo. What? Christina is like many others who agonize that free market competition and innovation are affecting their livelihood. Though I’m tempted to poke fun at the lunacy of her “companies pay unwitting individuals” view (workers on MTurk are not unwitting), I think a more constructive course would be to re-iterate the points of my post in March – Another Inefficient Market Meets Crowdsourcing. Businesses survive and thrive when they can pay the lowest price for the results they need delivered by the fastest possible means. This puts pressure on inefficient markets to become more efficient. These markets are eventually destined to be made more efficient as time, technology and processes mature. A market made efficient actually grows to many times its original ‘inefficient’ size. That benefits everyone. Those people with truly differentiated talents and work products will benefit immensely with these market expansions. Those people who are now faced with the erosion of demand for their current services have two choices. Either move upstream with the services they deliver, or, let the market pass them by while they whine about it. To those latter folks, as Kurt Russell says to Billy Bob Thornton in the movie Tombstone… “Are you gonna do something or just stand there and bleed”.